Back in the day, most kids in Toronto used to walk or bike to school while only a handful of kids started their day with a ride in the family car. Today, however, things are decidedly different. Recent studies show that a third of kids in Toronto’s school arrive in a personal car and another 20% are transported in a school bus. The way kids get to school has consequences on the environment, on our educational system, and on the bodies of our kids. Obesity in kids has become an epidemic in the United States and has quickly become a Canadian problem too. And the cost of running a bus is by no means small; each bus consumes, on average, more than 6,000 litres of gas in a year and costs our system upwards of $7,000, just for fuel. 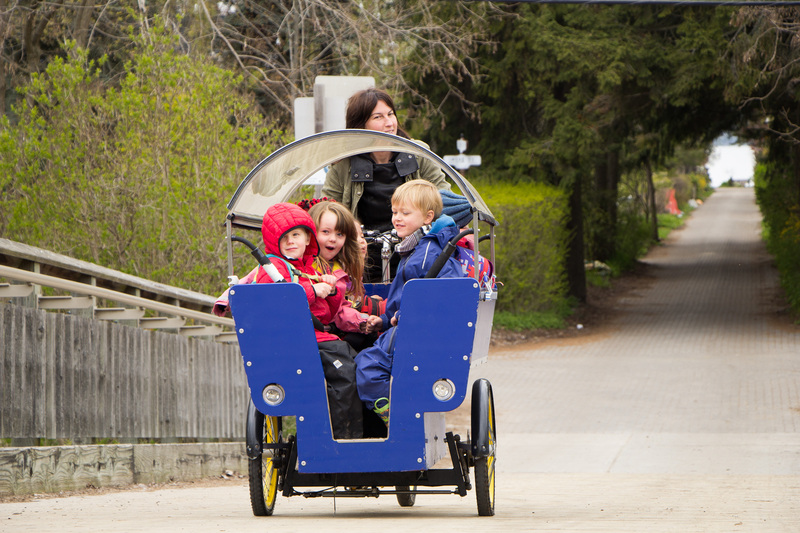 Enter the Waterfront Montessori Children’s Centre (WMCC) Bike Bus. 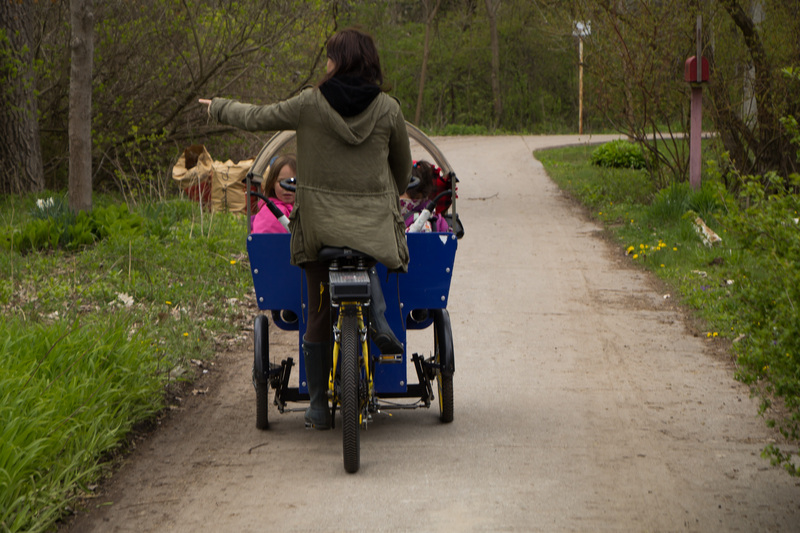 WMCC is a nonprofit, co-operative style Montessori style daycare on the car-free Toronto Islands, surrounded by idyllic waterfront territory. Most of the kids it serves live on the mainland and commute to the daycare every day by ferry. Up until about 2009, these kids were picked up by school staff using a small diesel yellow school bus at the ferry and transported about a kilometre to the school. But in 2010, this all changed when a tree fell on the petrol-powered bus. Rather than pay to get the bus working again, WMCC staff and parents recognized they had an opportunity to both save money, reduce emissions, and improve the school commute using a community bike. And so they invested in a bright blue De Redding Kindervervoer from Curbside Cycle, which has since become both a school mascot of sorts and a daily joy for the kids. My 7-year-old daughter and I visited WMCC to check out their bus and to learn more about the impact it’s had on the school. Derek Rayside, a parent at the school and the current “keeper” of the bike bus, met us at the ferry with his amazing family tandem bicycle. Together, we cycled around the island and to the school in order to better understand the bike’s impact, beyond the money it has saved and its environmental perks. This is what we learned. The bike has helped transform kids’ commute into a teaching opportunity. When the diesel bus was still active, the trip to and from the ferry was short; kids were speedily whisked to the daycare. With the bike bus, the trip has a much different character. Not all kids can fit in the bike bus at one time; the school’s daily routine, then, sees some kids on bike bus while others walk alongside or behind it. The entire trip can now take up 40 minutes to complete from the docks to the school or entrance. This time is not lost on the kids, however. Rather, the daycare uses the time to build kids experience with and respect for nature and the environment. On our commute to the ferry with the kids, we stopped to investigate local flowers, discuss bees and local birds, and relate the island environment to the environment of other waterfronts, like Florida’s. “We sing in the bike bus, we tell stories … we can incorporate the environment that we’re in during the bike ride,” explained Anne Doran, one of the WMCC teachers. Other teachers, like Katie Davidson, have used the bus to facilitate “conversations about momentum and force and speed … about why we get to school first.” Moreover, as the WMCC teachers explained to me, the bike helps teach kids to cooperate. They must learn learn to negotiate their turns in the bus. Anne said, “There’s a level of cooperation required" because the kids travel in such close quarters. The benefits of this new commute, however, are not always easy to explain. Some parents may be less than enamoured with the idea of kids’ exposure to cold temperatures during the winter, and long hikes. In addition, inspectors that visit the school sometimes fail to see the commute as an integral part of the school’s experience and have questioned the staff allocation required to support to the daily trip. For accreditors and inspectors, it is easier to see the school’s program as beginning once kids walk in the door, and ending when they leave the building. 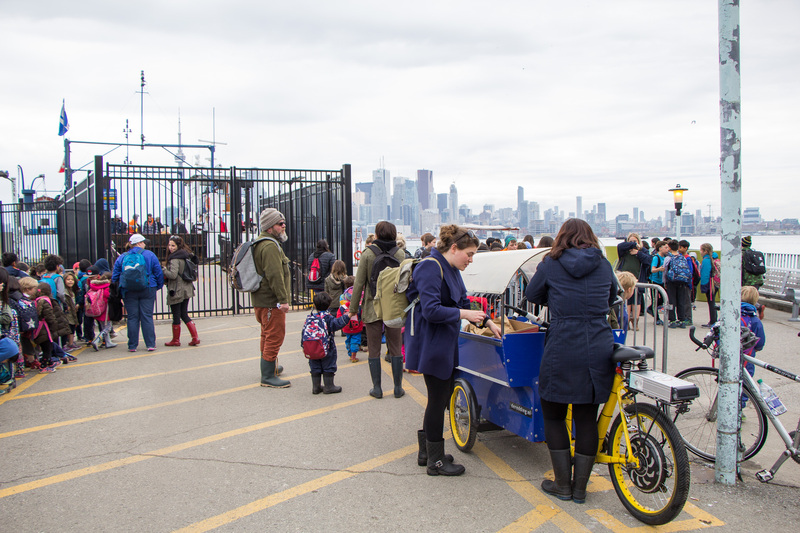 Similar barriers to cooperative cycling as an alternative to busing may exist for Toronto’s public schools, which have more staffing regulations and bureaucratic requirements than WMCC. But such barriers have not dissuaded the WMCC community. As teachers explained, “Even when it’s -20 out, the kids are still so happy” when the bike rolls out. Any difficulties associated with the trip are well worth the benefit. 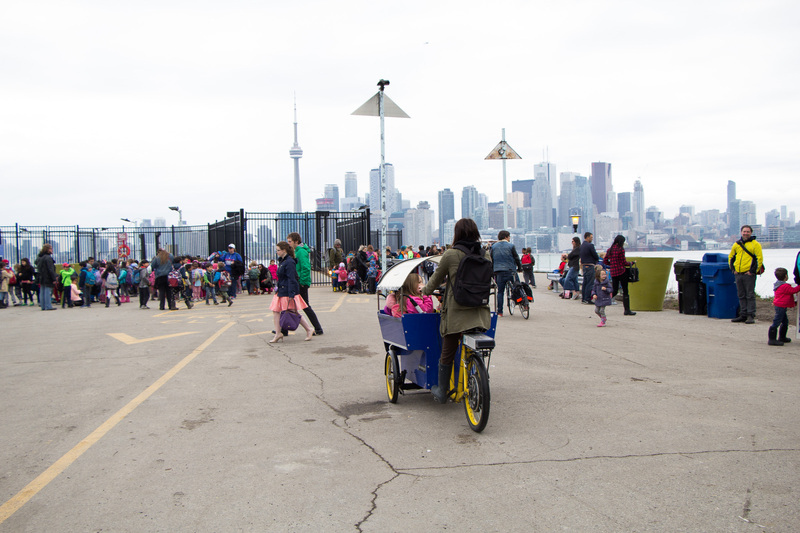 The bike bus brought the school together, and connected it more strongly to the island. Moving from diesel bus to bike was no small feat for WMCC. 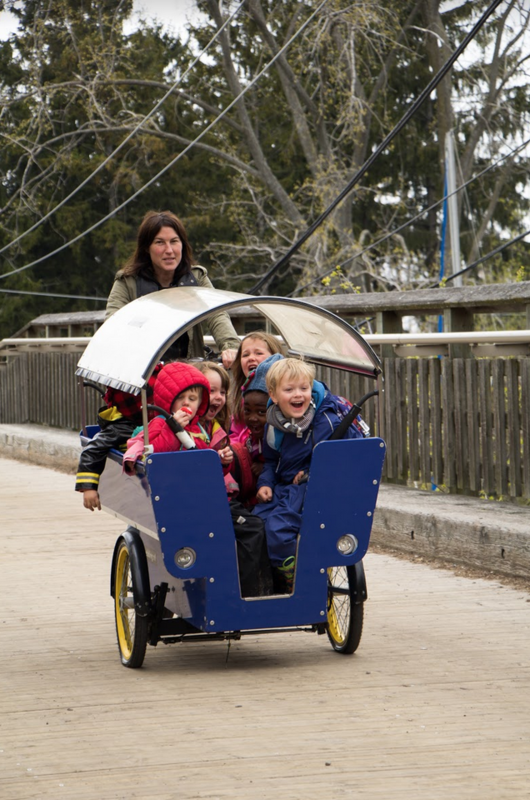 It took months to assess the school’s needs and do the fundraising for the bicycle, as the bike, along with the electric assist that helps it get up the bridge to Algonquin Island, cost the community more than $8,000. This required a major community effort. In addition, parents have since become responsible for the bicycle in many ways. My tour guide, Derek, worked with Malcolm Munro at Biseagal to add external derailleurs (gears) that are compatible with the electric assist. In addition, parent Katja Aga Sachse Thom and her company AGATHOM took it upon themselves to create a beautiful storage shed for the bike that is now a great source of pride for the school. This shed was designed mimic the trees and bushes that surround it, to merge with the island environment over time. “It had to have low maintenance,” Katja said, "It had to last a long time and not be an eyesore.” Moreover, the installation of the pre-fabricated shed had to be quick and was tightly coordinated with both the Toronto Parks department and the island community. And, Katja told me, everyone who worked on the shed had a close connection to the school: “The steelworkers, the people that poured the concrete … all were from the community.” It was a process that resulted not only in fantastic, award-winning bike storage unit, but in lasting community bonds. The bike is a lot of fun. 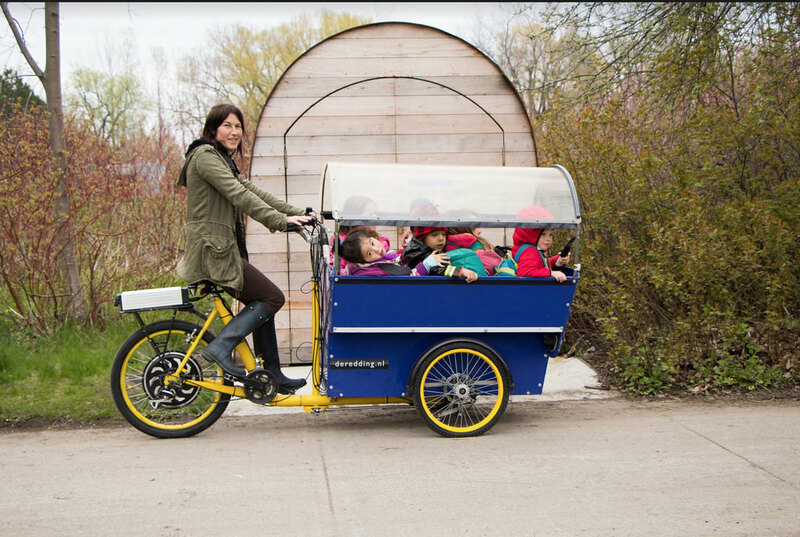 When our visit to the daycare was done and it was time to return to the ferry, teachers rounded up kids and asked who wanted to be in the bike bus. The answer: Everyone. “What’s your favourite way to get to the ferry?” I asked one of the kids. “The bike bus”, he told me. And you can take his word for it, too; everyone loves the bike bus. If only more schools in the GTHA would feel the love.